Somehow I cannot but think that things like these are world heritage, that should be publicly available for everyone to see and enjoy. Incidentally: a hijazi manuscript is also up for sale. 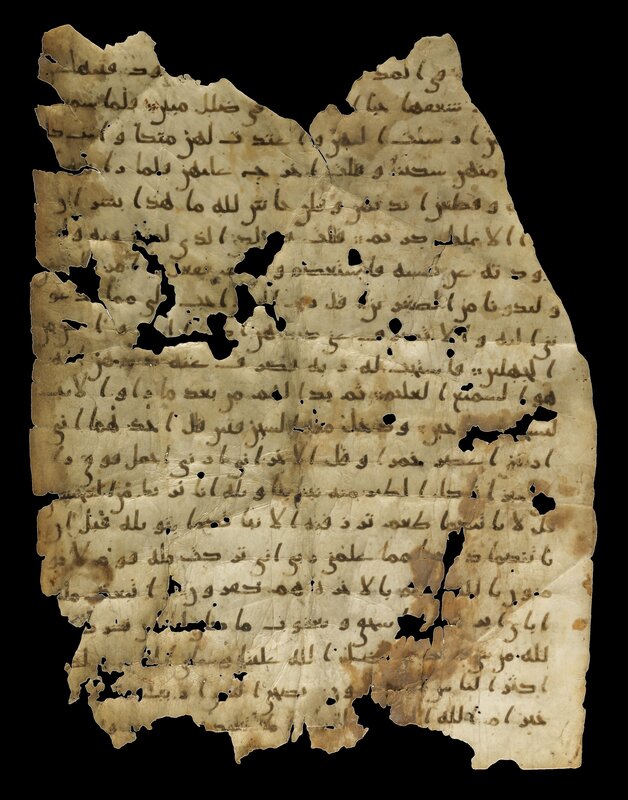 This type of manuscript belongs to the very oldest group of manuscripts we have of the qur’an. They are important for the study of early Islam and the textual history of the qur’an. They should not only be available for everyone to see, but also for all to study. The page from the blue qur’an contains surat al-Baqarah (2), verses 267 to 273. 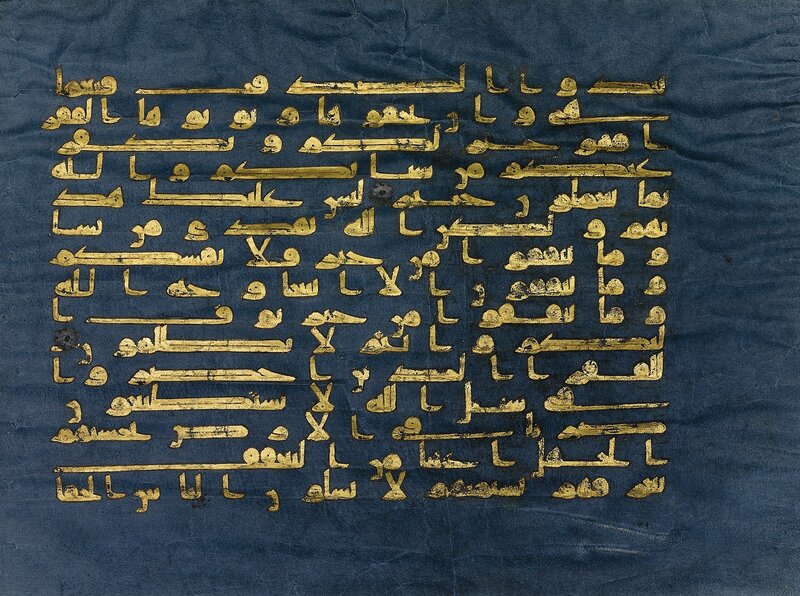 The hijazi manuscript contains surat Yusuf (12), verses 30 to 50. The other day I was discussing the qur’an with a Tunisian guy who had read one of my posts on the subject: the one on various textual versions, termed ‘recitations’ by Muslims. The canonical text of the qur’an exists in no less than 10 qira’at (‘recitations’) which are each preserved in versions by 2 transmitters, called riwayat, giving a total of 20 versions. It’s a touchy subject for Muslims because the term ‘versions’ suggests there being different texts of the qur’an. This is a gross overstatement of the facts and flies in the face of what most Muslims believe: that there is one, unadulterated text of the qur’an. Most differences between riwayat are indeed oral in nature, and are exclusively transmitted orally. They have no representation in the written or printed copies of the qur’an, not even in the colour-coded ones, where different colours help the reciter remember which rules of recitation apply where. The Muslim term ‘recitations’ however, also doesn’t quite cover it. Because not all differences between various riwayat are that oral. Some differences do reflect visually in the ink spots, so to say, amounting to different vowel-markings and different consonants, sometimes they even result in different words with different meanings. The latter occur not often and reflect differences that no Muslim needs to loose even one night sleep over. But still, the various riwayat seem to reflect some kind of textual history and show some traces of three centuries of transmission. My Tunisian spokesman happened to have studied riwayat Qalun, so there were a few very useful things he could tell me. But mostly he was adamant that I should understand very well that all these riwayat reflected only one text of the holy qur’an. God forbid that I should think these the result of textual emendations of whatever kind! He explained the two ways in which the ‘r’ could be pronounced in riwayat Warsh. And indeed, there is no way you can learn that without someone teaching you face-to-face. He told me about the rules he had had to learn and about his switch from riwayat Qalun to the more current riwayat Hafs. He also told me it was possible to recite one riwaya from the printed copy of another, provided you knew all the rules. These rules were established by the third (Islamic) century, classified, organised, systematised and written down in easy-to-learn poems. Recitation of the qur’an is a science. …he concluded. And it’s that phrase that stuck with me, because it isn’t. Sure, reciting the qur’an requires a lot of study, it’s a vast body of knowledge, it has acquired a structured way to be transmitted, one that’s so solid it has even found its applications on the internet, but it’s not science. It doesn’t formulate hypotheses and it doesn’t test them. There are no theories in the study of recitation, nor are they ever dismissed and replaced by better ones. It’s just a structured way to transmit a large body of knowledge, very impressive, definitely, but not science. Why had my Tunisian counterpart never realised this? He had studied at university in France, where he’s lived half his life. This guy was educated to the teeth. Only yesterday I realised that the cause is indeed very simple but subtle: there’s an Arabic word that had influenced the vocabulary of our conversation: عِلْم ‘ilm, usually translated ‘science’. But this is not a very good rendering. A better translation is ‘knowledge’ or ‘scholarship’. The Arab world in its heyday did develop the idea that you could formulate hypotheses and test them. They just never invented a word to distinguish it from ‘knowledge’ and ‘scholarship’. In the west we did, and ever since then, we’ve been discussing the merits of fields taught at university (e.g. history, theology and law) as a science. I’ve blogged before about the twenty canonical versions of the Qur’an and my quest to obtain the last of the four versions that are still in print: the riwayat ad-Duri. It’s turning out to be a harder task than imagined, as today’s guest post by my good friend Zelqet shows. Her Arabic is nearly fluent, her knowlegde of the local culture profound and she frequently goes to Cairo. Who better to ask than her? In 2008 I went to Cairo to do some work. As usual, I asked around the office if anyone would like anything from the wondrous Orient, and actually someone did: Shirhashirim would like a Qur’an. I was happy to find him one, since he had brought me amazing things from Iran including a wonderful chador, so finding him a Qur’an would be my pleasure. Seeing that I was somewhat mystified however as to why the Hoyatoleslam would need a Qur’an (he has several), he detailed his request. It was not just ‘a’ Qur’an, it was a specific recitation, that of a certain ad-Duri. After practising the expression ‘Riwayat ad-Duri’ several times (in a bar, oh haram, which should have indicated that this mission was doomed from the beginning), I went to Cairo and thought I could pick up the requested copy fairly easy. I visited several bookstores, and after a few began to discern a pattern. When I came in asking for a Qur’an, generally the face of the employee lit up in appreciation for the fact that I was actively seeking the Word of God. When I explained however that I was not merely looking for ‘a’ Qur’an but for a specific recitation, the appreciation quickly made way for confusion. A hushed whisper with someone higher up the command line, a few glances and a conversation I only picked up phrases from like ‘…ad-Duri?….What is that?….No I don’t know why she wants that….’ after which the employee would come back smiling and directing me to another store in which they certainly would have this specific recitation. Until I ran into a store that was seriously intent on helping me in my praiseworthy quest. Same scenario, same hushed whisper, I got ready to memorize the next address I would be directed to, but this store manager chose for another option. He picked up the phone and said: ‘I will make a call for you. To al-Azhar.’ Al-Azhar! Bring out the big guns, in Catholic terms that would be equal to calling the Vatican. It did make sense to me though; if anywhere they would have a bookstore specialized in recitations of the Qur’an, it would have to be at al-Azhar, the oldest theological university in the world. Why hadn’t I thought of that? And indeed, after a short phone-call the store manager assured me I would be most welcome there and they would have the book. So I went to al-Azhar, asked around for the bookstore, found it, asked for the recitation of ad-Duri, the face of the employee lit up in recognition, I was convinced this time I would get the book, but it turned out the recognition was meant for me and not the book. Yes, there had been a call and they had been expecting me, would I please follow him to the office? Of course I am prepared to drink tea, and lots of it, in exchange for the book, so I happily went with him and was shown into a room where a friendly elderly man radiating dignity was seated. This was when the first clouds of doubt wafted into my brain. The man identified himself as a teacher of al-Azhar and the clouds rapidly grew darker. Why did I want the recitation of ad-Duri? I explained this was for my very learned friend who would like to study all the recitations of the Qur’an. Did I know the Qur’an? I explained that I did and that I had great respect for the Word of God. The man nodded approvingly and said that I did not need the recitation of ad-Duri if I already knew the Qur’an. As a matter of fact, since I had come through great lengths to acquire a copy, did that not mean that I was seeing the truth in the Qur’an? The clouds made way for certainty: there I was in the religious center of Egypt, no, of the entire Sunni world, and I had to find myself an elegant way out of getting converted to Islam on the spot. (And still without the needed copy of ad-Duri, too, the rational part of my brain added helpfully). The last time Shirhashirim had asked me for anything I only had to persuade a store owner on the Khan el-Khalili to sell me his entire stock of miswak toothsticks down to the very last one, but this particular request had now landed me in an unforeseen and somewhat precarious situation. How to make a graceful and, even more important, timely exit? Luckily for me all faiths and religions attach the same value to the most obvious of excuses: the truth. I explained to the man that I did respect his religion and the Qur’an greatly, but that I was a Christian and thus had my own religion, was going to stick with that and really only would like a copy of the book. No converting today. That was acceptable (as I said it was a friendly, elderly man) but…the recitation of ad-Duri was not available. We parted ways amicably and in the taxi back to the center of town I decided that this had been enough fun. Next time Shirhashirim wants anything it had better be something harmless like, well, a complete store’s inventory of miswaks. Upon which the Hoyatoleslam simply said: ‘Could you write that down for my weblog…?’ And so here we are. If you are a Muslim you’ll probably be shocked, but really: even according to perfectly sound Islamic teachings there are twenty versions of the qur’an. This is -or should be- common knowledge among Muslims. Everything written below, can be found on reliable Muslim websites. I blogged before on the Arabic writing system and about the first script in which the qur’ an was written: a defective script that noted no vowels and made no distinction between a lot of consonants. It used only 15 signs to write 28 consonants, whilst the vowels had to be guessed by the reader. I explained these texts were nothing more than a helpful reminder for the qurra’, people who already knew the qur’ an by heart. Written qur’ ans were not intended to be complete and reliable codifications of the exact text. I also explained that eventually disagreements broke out and that these were partly solved by adding extra signs to the qur’ anic text. About a century after the first codification of the qur’an, so called ‘diacritical dots’ were added to distinguish different consonants and after another two centuries there was a generally accepted system for noting the vowels. This was only a partial solution. Because in those three centuries that saw the perfection of the Arabic writing system, transmission of the qur’ an was mainly oral. The Islamic reign expanded over half the planet in about one century. The Muslim elite became massively diluted: not all conquered people became Muslim and not all those who did become Muslim immediately put themselves to the task of memorising the qur’ an. In a time when travelling from one place to another was slow and dangerous, it wasn’t easy for individual qurra’ to check their memory with colleagues, unless they lived in the same place. This resulted in slightly different schools of reciting the qur’an, located in various cities like Mecca, Basra, Kufa, Medina or Damascus. Westerners would call this ’20 versions’, Muslims call it ’20 ways of reciting’. That sounds like a euphemism to cover up different transmissions of a text, but Muslims are not entirely wrong on this. The majority of differences deal with typically oral things like how long a pause or a vowel lasts, which letters assimilate and which don’t, which consonants need a nasal pronunciation, what glottal stops are omitted, things that aren’t typically written down in any language. A smaller percentage are actual differences in the vowels, that were added latest to the written texts of the qur’an. A slightly smaller part than that consists of differences in diacritical dots, that were added earlier than the vowels. Only a very small percentage are differences in the original Arabic lettering that was first used for the text. Some of these differences result in different meanings. In the opening chapter of the qur’an God is called “the owner of judgement day”. The word for “owner” is in some riwayat, but in some other riwayat it is “king”, a difference of one added vowel. Things like this can be found on the Internet (like in question B). As this example makes clear: these differences in meaning are nothing to loose a night’s sleep over. They are also not very frequent, which can be expected in a text that only took three centuries to be written down in an apt -or rather: made apt- writing system. Differences in meaning are easily explained: there is only one qur’an, but in different recitations. All recitations together form the entire revelation and the differences that are there are not contradictory but supplementary to each other. There is no such thing as a moral or an immoral book. Books are well written or badly written, that is all. I found this quote on a muslim site as an introduction to a posting that asked whether Oscar Wilde really was right in saying this. The text caught my eye for a completely different reason. Wilders himself claims he’s read the Qur’an hundreds of times. That’s a lot, for someone who has a job as a politician. In his view the book contains lots of violence, intolerance and hate, just like Adolf Hitler’s Mein Kampf. However, millions of muslims read quite different things into it. It’s unfortunate that there are too many muslims who seem to agree with Wilders, but that does not deny the fact that Wilders’ assertions about the Qur’an are open to discussion. Loads of people are feeling apprehensive about Wilders’ upcoming film. Muslims fear yet another insult to their religion, non-muslims fear muslim violence. All because of a book. Oscar Wilde’s quote puts things in a proper perspective: it’s no use labeling a book ‘immoral’, people are. If we forbid the Qur’an today, tomorrow it’ll be Brett Easton Ellis’ American Psycho (e.g.) and before you know it, we’ve reintroduced the Index of forbidden books. Monty Python was right: you never expect the Spanish Inquisition.